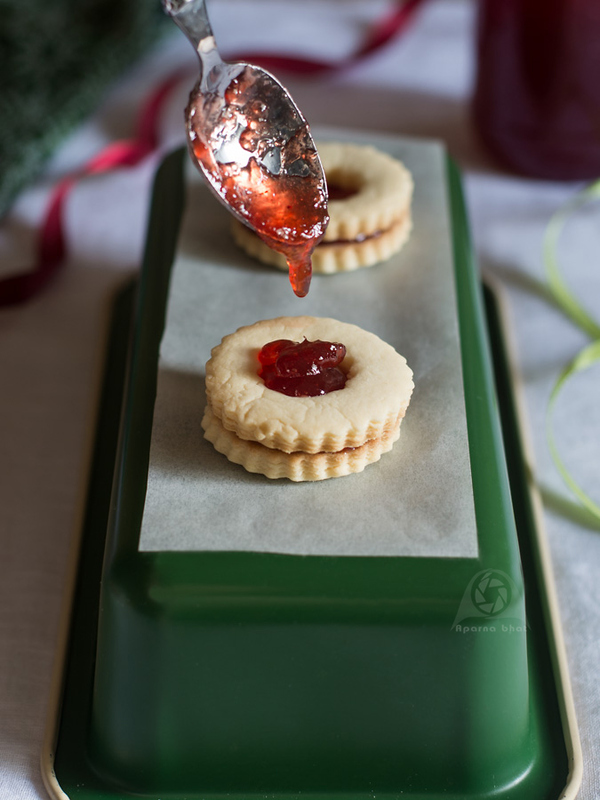 Today's recipe is about irresistible sandwich cookie with a jam filling that will appeal kids and put a smile on their face. 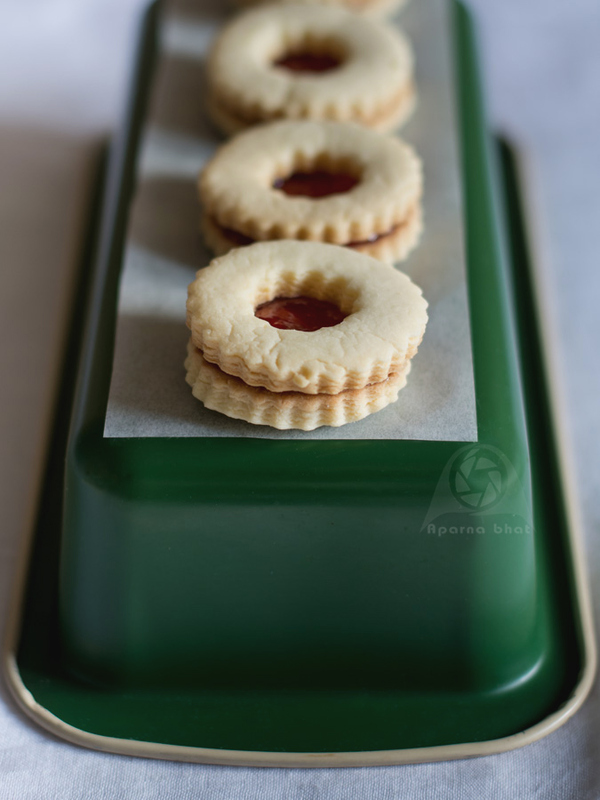 Super easy to make with easily available ingredients, these jam cookies will remind you of those prepackaged JIMJAM cookies bought from stores and bring back countless childhood memories. With school holidays on I decided to bake them and revisit those beautiful memories. Add this recipe (which is adapted from here) to your baking list and make your Christmas sparkle even more brightly. Cookie cutters in 2 different sizes. Remove the butter from fridge and allow it to rest on counter top until it comes to room temperature. Meanwhile, sieve the flours, mix it well in a bowl and keep it aside. Once the butter comes to room temperature place it in another bowl and cream it with hand or spatula. (you may use wire whisk). Now add confectioner's sugar and mix this well until it is smooth and creamy. Add vanilla, few drops of milk and continue mixing. Now fold in the flour mixture and mix it well until a soft dough is formed. You may use milk as required to soften the dough. This will enable us to roll the dough into sheets. Preheat the oven at 180 deg C. Line a cookie pan with parchment paper. Divide the dough into equal portions. Keep these portions covered at room temperature while you work on one portion of the dough. Sprinkle some flour on clean surface and roll out each portion of dough into sheet. The thickness should be about 1/8 inch, not too thick nor too thin. With the help of cookie cutter cut out discs or any desired shape. Do the same with remaining portions. From half of these total discs, cut a hole from the middle with a smaller/fluted cookie cutter. Transfer and place them on cookie pan leaving enough space in between 2 cookies. Bake them in preheated oven at 180 deg C for 12 -14 mins or until the edges begin to brown. Allow them to rest on cookie pan for 5 mins, later transfer them on cooling rack to cool down completely. 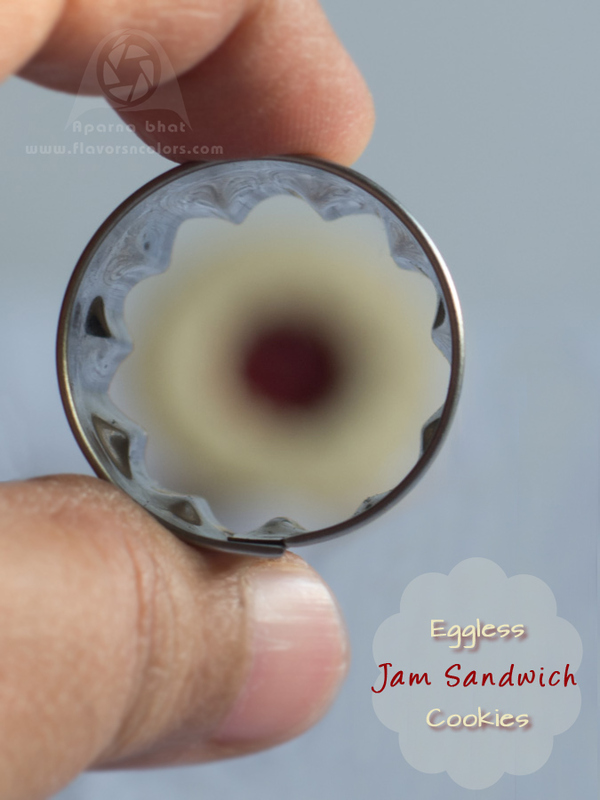 When ready to assemble melt the jam by warming it up in microwave for 1 min. For assembling, place the cookies (without holes), flat side facing up. 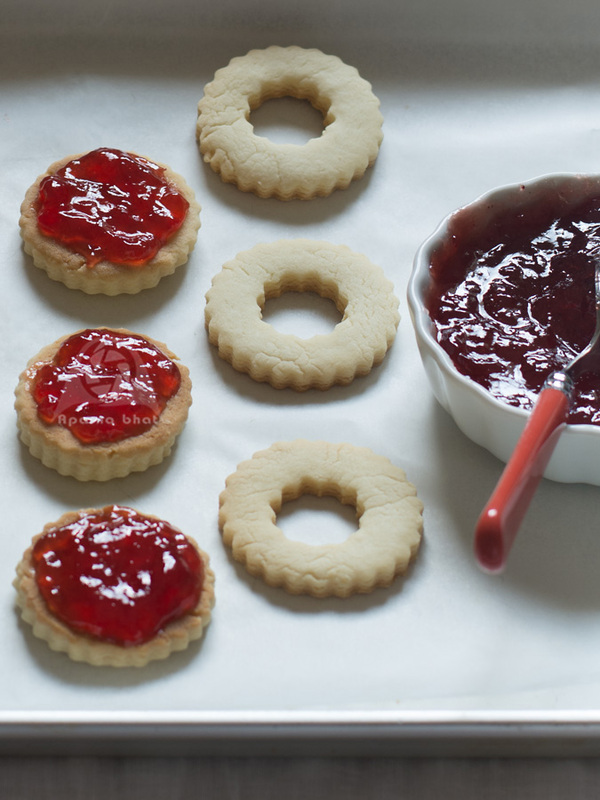 Spread mixed fruit jam evenly on each cookie[without hole]. Now place the cookie with hole on top and press it gently. Spoon out little more jam in the centre cutout. 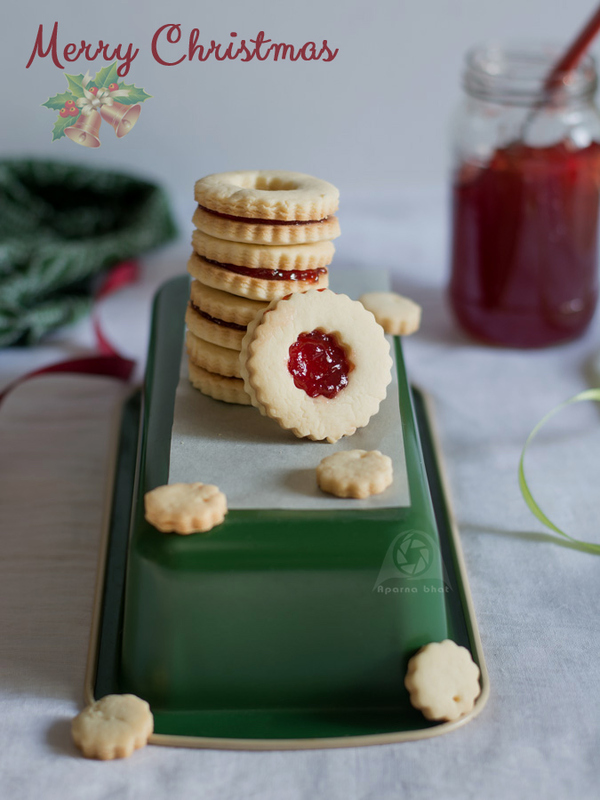 Eggless Jam Sandwich cookies are ready. Grab a cup of milk and enjoy these irresistible delights. To avoid cookies becoming soggy, store these baked cookies separate in airtight containers and apply jam over the cookies as you eat them.